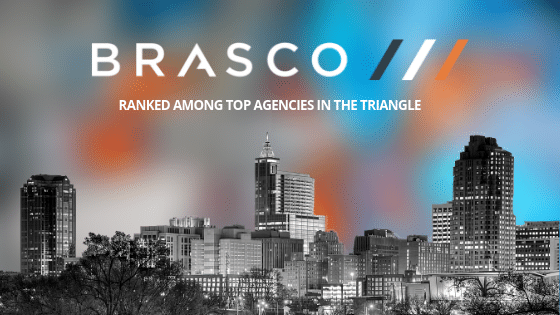 Brasco ///, an award-winning creative branding and digital marketing agency, has been recognized and listed in three industry lists for the 2018-19 Triangle Business Journal’s 26th annual Book of Lists. Each year, the Triangle Business Journal (TBJ) surveys agencies in the area and creates a listing to be published in its Book of Lists publication, recognizing high performing industry leaders across the Triangle region of Raleigh, Durham, and Chapel Hill, NC. Brasco /// was ranked #14 on the Internet Marketing & Design Firm list and top 20 in both Advertising and PR; this is the agency’s 5th consecutive year on the Internet Marketing & Design Firm list. “Finding ways to set yourself apart each year in a busy market can be difficult. We’re always searching for an edge. One of the ways that Brasco /// sets itself apart has to do with our ‘staying power’. We’re celebrating 10 years as an agency and we’ve learned a lot from our experiences during that time that has allowed us to continuously improve,” said Brian Batchelor, Partner and Creative Director of Brasco ///. “It is always gratifying when the hard work that we put in every day and the steady growth of our company is recognized. Our day-to-day business is fast paced, so it is refreshing to pause and thank those that have contributed to our agency’s success over 10 years.” said Brandon Ives, CEO of Brasco ///.